It won’t be available until Saturday, but of course Apple let the tech industry’s three most influential reviewers get their hands on units as long as a week ago. The Wall Street Journal’s Walt Mossberg, David Pogue of the New York Times, and Ed Baig of USA Today each today published their first reviews of final shipping units of the base model of Apple’s iPad. Mossberg is the most enthusiastic, stating “I believe this beautiful new touch-screen device from Apple has the potential to change portable computing profoundly, and to challenge the primacy of the laptop. It could even help, eventually, to propel the finger-driven, multitouch user interface ahead of the mouse-driven interface that has prevailed for decades.” But did you like it? Each reviewer notes Apple’s continuing refusal to allow Adobe’s Flash technology on the iPad (as it also refuses to allow Flash on the iPhone). The result for now is that majority of the most popular web sites will not display video. On the plus side, each reviewer notes the long battery life of the iPad: both Mossberg and Pogue do their own tests and find they get 12 hours plus, against Apple’s claim of a mere 10 hours. Baig complains that by comparison the Kindle can last up to two weeks. I’d be perfectly content with 12 hours. Each prefers the iPad to the Kindle for reading eBooks, although again Baig offers the weakest endorsement. From each reviewer one senses that the features missing from this first version are missing mainly to allow Apple the opportunity to release in a timely fashion new models that will force enthusiasts to junk their first purchase (Pogue states as much). Amazon has been successful in obsoleting Kindles as has Apple with its wide range of handheld offerings. Of course this will be the business model for the iPad. Can there be anything more ridiculous than a survey about what people will do with a product that hasn’t yet been delivered? All this hype is getting to me. The Apple hype machine once again has my complete respect. As I’ve stated before, I’m already on the list and ordered mine early. My excuse is one of professional necessity. If I’m going to predict the future, it sure makes sense to continually be part of it. What’s your excuse? He’s referring to an article published under tomorrow’s date on Apple Insider. Surveyed were 2,443 adults with a mobile phone, 770 of which own smartphones. And, as it turns out, this is an extremely prescient group! Adding to Bob’s questioning above, I wonder how something that does not exist can be referred to as a “trend.” Oh well, precise use of language has never been a strong point among technologists. As you can see above, 12.2% disqualified themselves altogether by stating that they “would never consider purchasing such a device.” Party poopers. Another 4.4% have been living in the deepest Amazon jungle for several months and have let Steve Jobs down by not knowing what an iPad is. Shame on them. 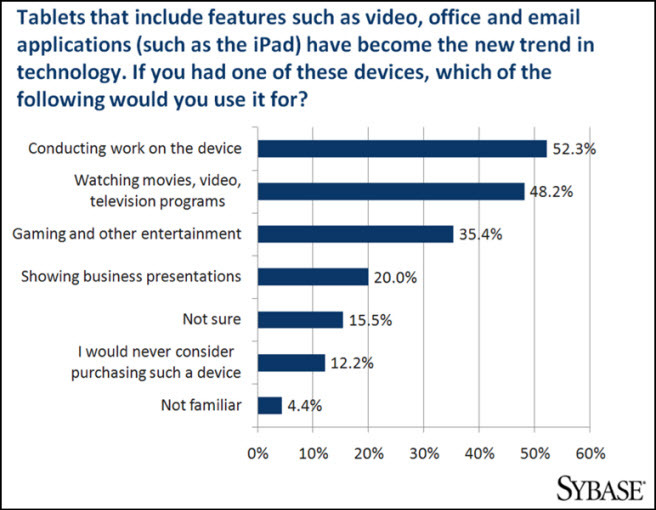 Based on the phrasing of the question, apparently 15.5 % of those surveyed do plan to purchase an iPad without any idea of what they’ll use it for. Discretionary income put to good use. The rest intend to use it for tasks they can already perform on existing computing hardware. Very creative. I think I’ll just drop this warm potato right here. It speaks so eloquently for itself. 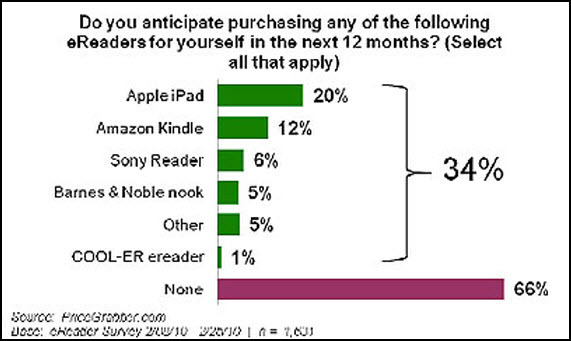 Update, March 30/2010: MediaPostNews Online Media Daily has found another survey (from a firm named “PriceGrabber“) that boldly predicts that of the 34% of those surveyed who intend to buy an eReader of some sort next year, 59% will choose the Apple iPad versus 35% who will choose a Kindle, and half that percentage the “Sony Reader” (presumably all models from Apple, Amazon and Sony are included). Focusing on the e-reader market, the PriceGrabber study found that four of five consumers want to pay less than $250 for such a device. Since that would rule out the iPad, which sells for $500 at the lowest price, either people aren’t aware of what the Apple tablet costs or they are willing to pay more for its versatility. The average price of the top 10 eReaders on PriceGrabber.com is $241. 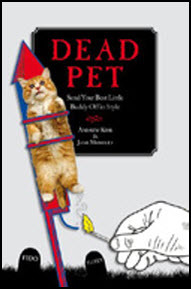 I was reminded of my blog entry from last July, where you can find a similar collection from public libraries, yet a richer one, as we’re often treated to some of the oddities within the book as well as the cover and the title. The Pew Research Center’s Project for Excellence in Journalism, a nonpolitical, nonpartisan research institute, funded by the Pew Charitable Trusts, has just released its 7th annual The State of the News Media (2010 edition). The 25-page Executive Summary is available for PDF download, but the entire study, running some 700 pages, can only be printed section by section from here. The numbers for 2009 reveal just how urgent these questions [about the future of the news media] are becoming. Newspapers, including online, saw ad revenue fall 26% during the year, which brings the total loss over the last three years to 43%. Local television ad revenue fell 22% in 2009; triple the decline the year before. Radio also was off 22%. Magazine ad revenue dropped 17%, network TV 8% (and news alone probably more). Online ad revenue over all fell about 5%, and revenue to news sites most likely also fared much worse. Only cable news among the commercial news sectors did not suffer declining revenue last year. …we estimate that the newspaper industry has lost $1.6 billion in annual reporting and editing capacity since 2000, or roughly 30%. That leaves an estimated $4.4 billion remaining. Even if the economy improves we predict more cuts in 2010…Staffing at the news magazines Time and Newsweek since 1983 is down by 47%. More to follow, but I’ve got an appointment with my psychiatrist which I think takes precedence. A blog entry on Richard Curtis’ very good E-Reads site struck a strong chord with me today. I did not attend TOC, so of course cannot offer any comments on the event, but I am beginning to suffer a serious case of future fatigue. The media continues its feeding frenzy on every trivial piece of tech news that it can uncover, largely, I believe because it has always perceived publishing in all its forms as the most important subject known to mankind. Earthquakes in Haiti and Chile. Yeah, ok, a few headlines, but what about this: “Google Reaches Books Deal With Italy.” I’ll confess: didn’t even glance at it. My foolish dream is that the big fat tech companies, Google, Microsoft, Apple, Amazon, Intel et al., would jointly declare a 12 month moritorium on heavy-duty R&D and marketing expenditures and offer a portion of their billions to tech workers around the world, who would receive, for example, $40k plus cost-of-living expenses, and would commit to working in third-world countries helping to improve infrastructure, sanitation, education, health care, and a long list of other crucial problems. The money would be paid monthly to the workers; if you quit early, that’s the end of it. If you work the full year and if your supervisor rates your efforts at a minimum of 7.5/10, you receive a $8k bonus. Oh well, enough of my fantasy. Back to reading the endless blogs, Publishers Weekly and The Economist, and thinking about how most publishing technology is only barely managing to improve this world we inhabit.